At Northside Salvage Yard we pay you top dollar for your junk car. 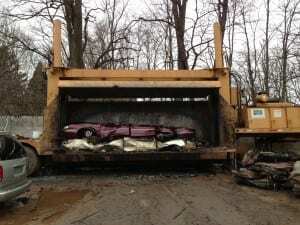 As the largest auto crusher in the Rochester area, you can trust us to recycle your car in the correct way. We don’t cut corners, and instead do everything the right way. If you love your car, you may feel a little guilty about junking it. Don’t worry, by selling your junk automobile to Northside Salvage Yard you are not only ending its suffering, but you are actually helping other cars out there on the road. Depending on where the recycled steel ends up, part of your car could easily live on as part of a brand new vehicle. Plus, not unlike when humans donate organs, your car’s usable parts will be stripped down and used to help another vehicle have a longer, more productive life. With today’s struggling economy, many people rely on quality used parts to fix their vehicles. If it were not for the junk cars that donate those used auto parts, then those people could not afford to fix their cars and would most likely end up out of work. Furthermore, selling a junk car to Northside Salvage Yard means that the vehicle will be recycled in accordance with all local, state, and federal laws that dictate the disposal of hazardous waste products. That old car will no longer be leaking fluids onto your yard and killing your grass. Instead Northside Salvage will remove all of the car’s fluids at the beginning of the recycling process. It can be hard to let go of a car you love, even when it no longer functions. However, selling your junk car to Northside Salvage ensures that it has the opportunity to help other vehicles continue to run and to help manufacture new cars. If it is time to say goodbye to your old car, give Northside Salvage a call. We pay top-dollar for junk cars. Afterwards you can reward yourself with something nice or have some fun. Your car would have wanted it that way.